Candido De Sousa, 45, a teacher at the school in Tica were the Caritas aid distribution took place, has seen at first hand the problems facing the community.Candido, who has worked at the school for eight years, and his wife and five children were spared the worst of the cyclone, which left their house undamaged.But the school was badly hit. “I felt so bad because I could see my school was totally broken,” he says. 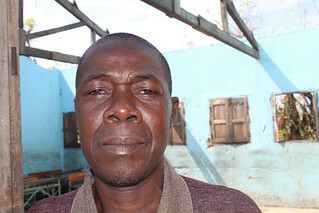 “The roof was missing and there was a lot of damage.”“In the days after [the cyclone], the teachers organised staff and pupils to clear up as best we could,” he adds. “You can see there is no roof still but we started classes again last week.”Before the cyclone, the school had 27 teachers and 1,600 pupils in two buildings and a number of other outhouses. Although classes have resumed, Candido says only half of his students are now attending.“I think this is down to the damage and the situation people find themselves in,” he adds. “We have noticed big changes in the children who are attending. They have never witnessed anything like this in their short lives.”Candido says the children are facing trauma, hunger and the effects of homelessness.“The children are hungry. They are constantly thinking about when there might be a food distribution,” he says. “Sometimes I ask before class how many of the children have eaten before coming to school and none raise their hands.”The teachers are hoping that the school will be quickly repaired, reorganised and classrooms re-roofed, but they fear a long wait, with staff facing their own hardships and school documents were destroyed in the floods.“I am really worried about the children,” says Candido. “I can’t feel comfortable knowing children are not eating, are missing school and have lost their books and uniforms.”There are many affected by the cyclone who are still in need of help. Caritas workers say that people urgently need more food and clothing, cereal seeds, construction materials and kitchen kits.